For those of you who have not been to the University of Iowa to view the Mildred Wirt Benson archives, there are many articles written by Mildred during her newspaper career. One article that intrigued me was from 1966. It is called Copan: Ghost City of Stone and is about Mayan ruins in Honduras. Lucky me, I just happened to have a friend who was staying in Honduras for the month of May. So I bought an airline ticket and set off to follow in Millie's footsteps. In 1966, when Millie visited Copan, it was a difficult and adventurous journey. This time, it wasn't that difficult, but it was still adventurous. Mildred flew into Belize and then on to Tegucigalpa (the capital of Honduras) and from there flew in a small plane to Copan. I flew from Houston, Texas to San Pedro Sula (the 2nd largest city in Honduras after Tegucigalpa) and then took a 2 and a half hour bus ride from San Pedro Sula to Copan. The bus was air-conditioned and even played a movie to entertain us during the ride! Mildred describes the interior of Honduras as still in the Ox cart stage. Well, I didn't see any Ox carts, but I did see several carts pulled by horses. Mildred also mentions waiting while her plane picks up cargo of tobacco. Tobacco is still grown in the region and is a major source of income for the area. I noticed many tobacco fields on my bus ride into town and there were several shops selling local cigars. The ruins are only a half a mile from the town and I walked the distance easily. Harvard scholars began the 1st real study of the ruins in 1975. This is 9 years after Millie was there! It was declared a National Monument in 1982. They now charge $10 to enter the park. Several of the monuments have been removed to museums and replaced with replicas so that you still get the full effect of the statuary. The pieces that are original are covered with shelters or tarps to protect them from the elements. Erosion is a big problem with these artifacts! 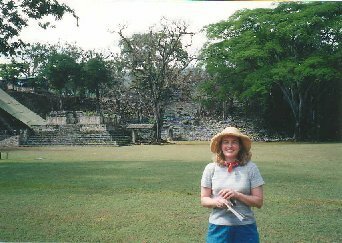 I was very impressed by the ruins at Copan, and I am not the only one. Mayan Scholars have praised Copan for the information that they have learned about the Mayan culture from the hieroglyphics and monuments here. I could have used Nancy Drew's help while in Copan. On my last day in town, I discovered that my cell phone was stolen from my luggage. So much for security at a $10 a night hotel! :-) I was surprised because my cell phone service does not work in Honduras, but I guess the phone itself could be worth something. Luckily, I was smart enough to carry my passport and cash on my person at all time. When I mentioned the theft to the hotel proprietors, they at first did not understand me... our English and Spanish vocabularies being about equal and when I finally was able to make my self understood, of course they had no idea how such a thing could have happened. I am sure that Nancy Drew (no doubt fluent in Spanish) could have investigated and brought to justice the culprit. (perhaps a rival hotel owner trying to sabotage the reputation of this place). Although my bet is on local kids looking for some easy cash. Well, the crime goes unsolved and I needed a new cell phone anyway. The Copan of 1966 might have been more primitive, but I don't think the locals were rifling through Millie's luggage looking for valuables! 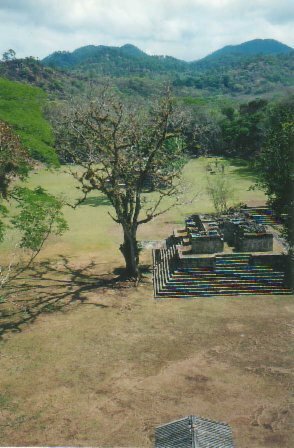 Don't let my experience deter you from visiting Copan. As always when traveling in a foreign country, you should be on your guard. The rest of my time in Honduras was lovely. The food was fantastic and most of the people were very friendly.